Professional Tile Setters At Your Service! We Specialize in Residential and Commercial Tiling. Call Happy Bathrooms Renovations for all your floor tiling and wall tiling needs. We provide professional tile installation for your floor, walls, kitchen backsplash, and any other home remodeling projects. Your renovation and remodeling ideas are endless – updated tiles with a new pattern or color on your kitchen floor, replace those fake tiles with beautiful real tiles, install an eye-catching new tile backsplash behind your kitchen sink, add tiling in a pop of color in your shower – the list goes on. Whether you need kitchen renovation and remodeling or a tile professional for your bathroom projects, just give us a call for advice and a FREE quote. 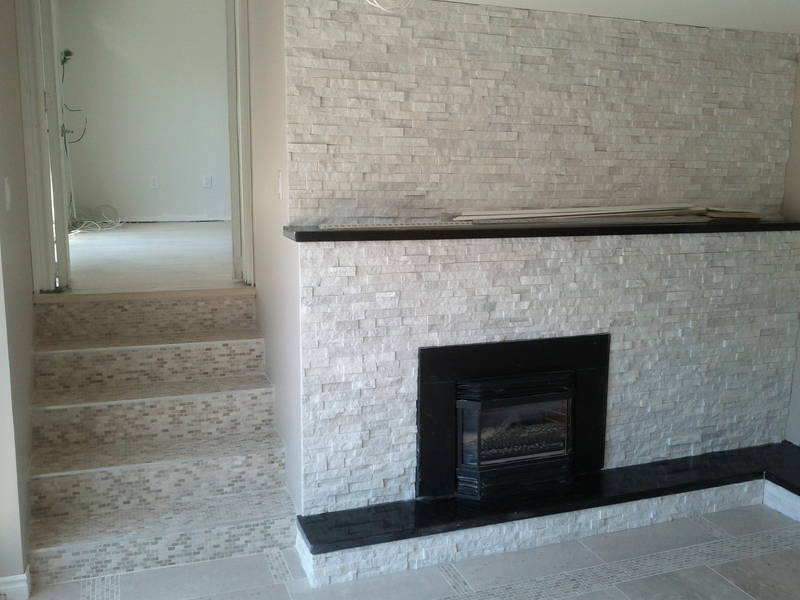 We can install any type of tile such as marble, granite, ceramic, glass, stone, and slate quickly and at an affordable rate. Many home owners think that DIY can save them money, but it can be costly and time-consuming, and the end result can be sloppy. We are true tile professionals. 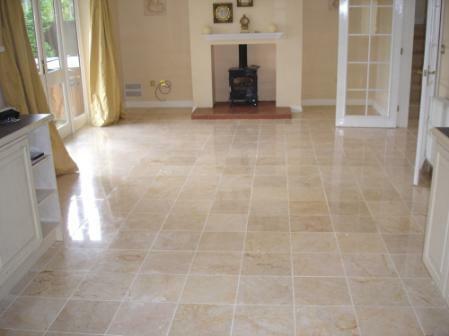 We cleanly and efficiently remove old tiles and can replace them with any type of tile. You can spend your day running errands, going out to see a movie, or just relaxing at home or at the spa while you wait for your new bathroom. 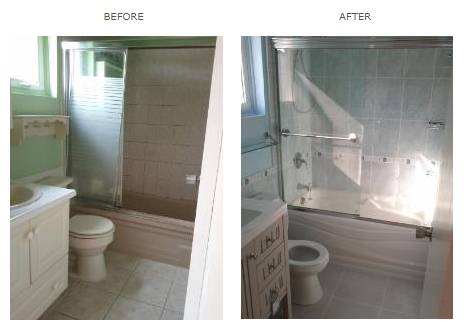 We promise you will love your new bathroom when we’re done. It’s amazing how a simple difference like changing tiles can refresh the entire look of your bathroom. 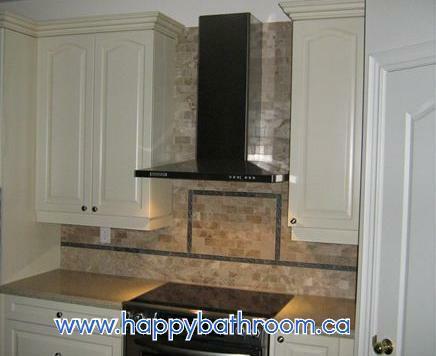 Happy Bathrooms Renovations is not just for bathrooms – we also offer kitchen renovation and remodeling. Many home owners love the functionality and style of installing a tile backsplash. This square of tiles, installed on the wall behind the sink, will make it easier to wash any stains and water splashes, and it saves the walls from excess damage. We can also add beautiful new tile in your favorite material and colors to your kitchen floor. Many older homes have outdated or fake tile. A simple remodeling idea is to install a new modern tile design with an easy to clean material. This will instantly make your kitchen look new. Tile installation is an excellent way to increase the value and appeal of a home FOR SALE. Some patterns look dated and worn. Decades of wear and tear can cause tiles to crack – the raised tile pieces can even pose an accident risk. Just give us a call and we will offer you helpful advice and a free quote so you can get that renovation and remodeling idea started. If you are unsure of what type of tile to get, or how much the project will cost you, we can offer our expert expertise and guide you in making the right decision for the look you desire. A tile contractor can offer the efficiency, expertise, and knowledge that you cannot access when attempting a DIY project. Don’t sit in the middle of your half-tiled kitchen floor in a fit of despair; Happy Bathrooms can get you out of any DIY-gone-wrong fiasco. Or save yourself the trouble and call us first – you may be surprised how affordable it can be to hire a tile professional – and save on the time and frustration, too. We provide Home Renovation, Bathroom Renovation and Remodeling Service, Kitchen Renovation and Remodeling Services in Toronto area, North York, Woodbrige, Richmond Hill, Newmarket, Etobicoke, Aurora, Markham, Vaughan.